DataPagerPresenter - wraps the entire UI of RadDataPager and is of type DataPagerPresenter. [Border] - wraps the visual and layout elements of the DataPagerPresenter's template and is of type Border. It is responsible for the background and the border color of the DataPagerPresenter. [Grid] - layouts the two groups of UI of the DataPagerPresenter - buttons and textbox - and is of type Grid. [StackPanel] - layouts the First, Previous, Numeric, Next, Last buttons and is of type StackPanel. [RadButton] - represents the First Page button and is of type RadButton. [Rectangle] - represents a part of the shape inside the button and is of type Rectangle. [Path] - represents a part of the shape inside the button and is of type Path. [RadButton] - represents the Previous Page button and is of type RadButton. [Border] - hosts the control responsible for the numeric buttons, and is responsible for the border around them and the background behind them. It is of type Border. [NumericElementsPresenter] - wraps the UI for the numeric buttons and is of type NumericElementsPresenter. [RadButton] - represents the Next Page button and is of type RadButton. [RadButton] - represents the Last Page button and is of type RadButton. [StackPanel] - layouts the TextBox and the labels connected to it. 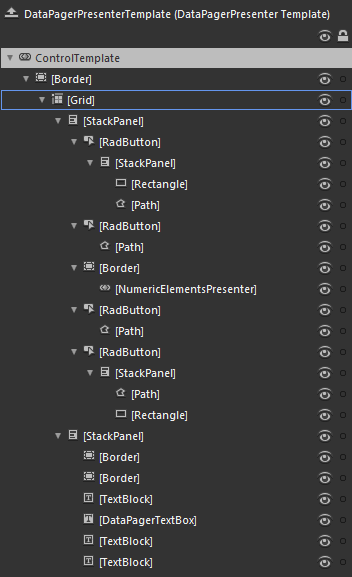 It's of type StackPanel. [Border] - represents a part of the separator that separates this group from the other buttons and is of type Border. [TextBlock] - displays the "Page" label and is of type TextBlock. [DataPagerTextBox] - represents the input element for the current page and is of type TextBox. [TextBlock] - displays the "of" label and is of type TextBlock. [TextBlock] - displays the label for the total pages count and is of type TextBlock. The numeric buttons are of type RadRadioButton. PageButton - represents the border and the background of the button and is of type Border. [Border] - represents the inner background of the button and is of type Border. [ContentControl] - displays the content of the button and is of type ContentControl.